The next few songs on my list of 40 are truly my most listened to in my life songs. They are songs that I will never grow tired of. That has to be the magic of a song is it's amazing ability for no matter how many listens it is like hearing it for the first time. 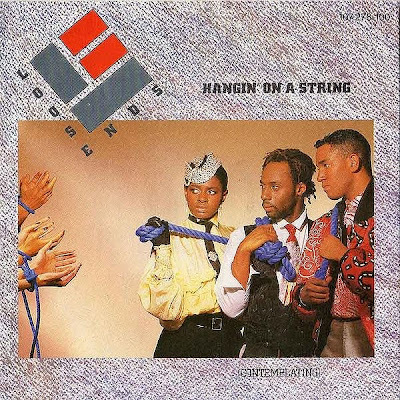 Song number 33 is Hangin' On A String (Contemplating) by Loose Ends from 1985. It was their fourth single by the original successful line up. They were Carl McIntosh, Steve Nichol and of course Jane Eugene. This is one of my favourite vocals on a pop song. The song was a number 13 hit in the UK and got to number 43 on the Billboard Hot 100. (Something I didn't know until today, thank you Wikipedia). It was also a number one hit on the Billboard R'n'B chart so maybe some of you American bloggers remember it? Loose Ends had a number 16 hit with Magic Touch also in 1985 which was also good but no Hangin' On A String (Contemplating). Both songs were from the album So Where Are You. The song also proudly brings out the music OCD in me as it reminds me of how much I like song titles that contain words in brackets. When I read a song title it has to be written as it originally was such as no g in the word hangin'. Loose Ends also had a hit with the anti-drugs song Don't Be A Fool in 1990 though by that time the band was then just Carl McIntosh with new vocalists. A remix of Hangin' On A String (Contemplating) got to number 25 in the UK in 1992 as well. From February 1985 this is Loose Ends and Hangin' On A String (Contemplating). LOVED this song! I haven't heard it in ages. And yeah, it's the closest they ever came to a pop hit in the US. I too LOVED this song. There was something about it's grown-up sophistication that really captured this rural Irish teen's imagination. Maybe it was just that word in parentheses. Scritti Politti did the same thing with Wood Beez (Pray Like Aretha Franklin) that, as well as expanding my vocabulary, made me a fan for life.